Canadians are now suggesting that any potential trade war with the United States of America would put their economy into a complete recession; giving President Trump a heavy-handed victory over Trudeau by default. The war of words between the two neighboring nations heated up after the G7 Summit, where “weak and dishonest” Canadian Prime Minister Justin Trudeau stopped at nothing to take shots at the President of the United States of America after Trump left the Summit of allied nations. Those comments from Trudeau have since been vilified by both American and European media outlets, who feel that the Prime Minister of Canada went extremely low to attack the President behind his back, and it's widely known that Trump has yet to forget those words and probably won't anytime soon. During the G7 Summit, the 45th President of the United States of America remained adamant in his refusal to sign a joint communique between nations; until Canada decided to show a willingness to remove its heavy tariffs on American imports that unfairly promote our northern neighbor. Since then, an Ambassador to Canada from the United States of America, Kelly Craft,<a href="https://thegoldwater.com/news/28881-Ambassador-to-Canada-Kelly-Craft-and-Trump-Family-Mailed-Death-Threats-after-G7"> was sent violent death threats and a white powdery substance in the mail </a>to the US Embassy in Ottawa, Canada. The gross act is now being shunned by Canadian media outlets, who also have expressed a desire to avoid any further disputes with the United States of America because such a trade war would be absolutely futile for the Canadian economy, as reported by HuffPost Canada today. Scotiabank's Brett House, Juan Manuel Herrera, Rene Lalonde and Nikita Perevalov all participated in authoring the report, in which they believe Canada has no choice but to make a deal with the United States. “A ramp-up in protectionism in the U.S. results in a negative impact on growth in each of the NAFTA partners' economies," said the report. The United States of America has already imposed tariffs on both Steel and Aluminum imports, which affect Canada, Mexico, and the European Union; in order to protect America steelworkers first. Then on Friday, President Trump blasted China with another 25% tariff that is set to hold onto at least $50 billion worth of Chinese goods coming into the United States of America on July 6th. President Trump has, of course, received critique from the liberal media for such policies, but by placing American workers first the President holds into his campaign promises and lets the world know that the United States will no longer be trampled upon by foreign governments. The Administration has also stated that if necessary he would place future tariffs on foreign-made automobiles, which could spark an incentive to build additional manufacturing hubs inside the country. No doubt Canadians are dreading any trade war with the recent reports suggesting it would crush Canada, and with this fact remaining it certainly gives the 45th President of the United States of America the upper hand in any future North American Free Trade Agreement (NAFTA) discussions. If NAFTA were to fall apart entirely, there would be a .2 reduction to Canada's overall growth in 2019, as well as there being a 3.8% tariffs across the board, per the Scotiabank report. Canada's GDP would also see a .4% slump, that would come amidst a NAFTA collapse. If the President decides to pursue an all-out trade war, it certainly wouldn't be America that will suffer, but the very nations such as Canada which hold resentment for the President. The current tariffs already put in place by the Trump Administration only affect 3.1% of total Canadian goods, so for Prime Minister Trudeau to not make a deal would be incredibly naive and harmful to the nation of Canada. President Trump is certain to see a victory here, no matter what Trudeau does. 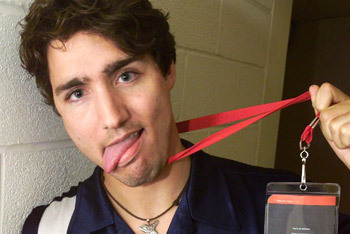 Besides, we're quite certain that Trudeau has enough problems keeping his eyebrows glued on. A trade war is both good and bad for the US. The bad: Expect a shortage of goods in the stores. Expect higher prices for some goods. The good: America will be FORCED to re-industrialize and start manufacturing and mining and refining and milling and producing again. We'll get better quality products. We'll have more jobs for people in the future, more jobs for the common folk. I'm game for this. Prepare now, some hard times will come but this will lead us to a much better future. The reason the US (and the world) is in this pickle in the first place was because our incompetent, arrogant and corrupt leaders allowed the outsourcing of our industries since the 1980s. Since the 80s we have seen real productive jobs go overseas and this created an era of debt insolvency, poverty and welfare dependance. Other countries like China took huge advantage of our leader's idiocy over the years! Guaranteed there were backdoor bribes for corrupted US policticans as well. The tariffs and trade war should have started in the 80s against the very companies that started outsourcing our jobs. It would have made them think twice. Too late now, I hope Trump blows the damn system apart so we can start all over.